If running-and-gunning or hunting from tight quarters is your style, then the R10 is the crossbow for you. It's the smallest Ravin ever made, measuring just 33" and tipping the scales at a scant 6.8 pounds. Don't let the Ravin's compact size fool you. The powerful R10 with HeliCoil Technology generates 400 FPS with devastatingly accurate downrange precision. HeliCoil is the engine behind Ravin Crossbows. This revolutionary technology has several industry changing advantages that all work together to create the most accurate crossbow ever designed. HeliCoil Technology coils cables away from both the top and bottom of the cams in helical grooves keeping the cams perfectly balanced. This allows the cams to rotate an incredible 340 degrees, while both cams remain perfectly level when drawing and shooting the crossbow. Designed exclusively for Ravin with a handsome, slim and sleek design, this heavy duty, black soft-sided padded case is designed to first and foremost protect your Ravin Crossbow from damage. 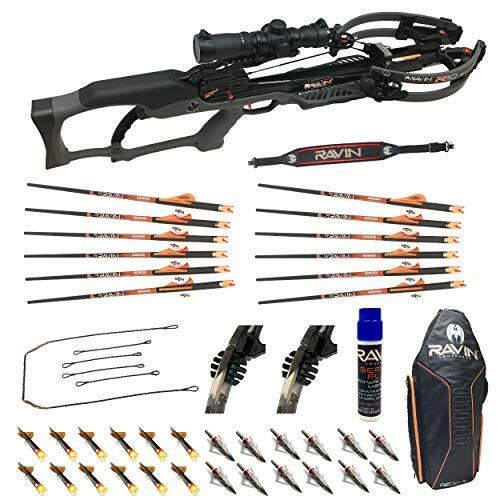 It can comfortably store a fully assembled Ravin Crossbow with mounted scope, quiver and bolts for quick and easy use. Ravin Crossbows R10 Crossbow Package (Gunmetal Grey) with 4x32 Illuminated Scope -- Fires Bolts Up To 400 Fps! Last updated: April 20, 2019 at 11:54 EST. Pricing information is provided by the listed merchants. GoSale.com is not responsible for the accuracy of pricing information, product information or the images provided. Product prices and availability is subject to change. Any price and availability information displayed on amazon.com or other merchants at the time of purchase will apply to the purchase of the product. As always, be sure to visit the merchant's site to review and verify product information, price, and shipping costs. GoSale.com is not responsible for the content and opinions contained in customer submitted reviews.